Sumo (相撲, sumō) is a Japanese style of wrestling and Japan's national sport. It originated in ancient times as a performance to entertain the Shinto deities. Many rituals with religious background, such as the symbolic purification of the ring with salt, are still followed today. In line with tradition, only men practice the sport professionally in Japan. The governing body of professional sumo is the Japan Sumo Association. Six tournaments are held every year: three in Tokyo (January, May and September) and one each in Osaka (March), Nagoya (July) and Fukuoka (November). Each tournament lasts for 15 days during which each wrestler performs in one match per day except lower ranked wrestlers who perform in fewer matches. All sumo wrestlers are classified in a ranking hierarchy (banzuke), which gets updated after each tournament based on the wrestlers' performance. Wrestlers with positive records (more wins than losses) move up the hierarchy, while those with negative records get demoted. The top division is called "Makuuchi" and the second division is called "Juryo". At the pinnacle of the sumo hierarchy stands the yokozuna (grand champion). Unlike wrestlers in lower ranks, a yokozuna cannot be demoted, but he will be expected to retire when his performance begins to worsen. The best way to see sumo is to attend a sumo tournament. Tickets are sold for each day of the 15-day tournaments. They can be purchase in advance through the official vendor or via buysumotickets.com. Alternatively, they can be purchased at convenience stores (some Japanese skills required) or at the stadiums. Located closest to the ring, ringside seats are most expensive and most difficult to get. Ticket holders sit on cushions on the floor and are exposed to the risk of injury due to wrestlers flying into the spectators. The rest of the stadium's first floor consists of Japanese style box seats, which generally seat four people (although there are a few with higher and lower capacities, as well). Shoes are removed, and spectators sit on cushions. Tickets are sold for entire boxes regardless of whether they are fully occupied or not, i.e. two people using a 4-seat box will still have to purchase all four tickets. Box seats are further classified into A, B and C boxes according to distance to the ring. On the second floor balcony, there are several rows of Western-style seats. Balcony seats, too, are further classified into A, B and C seats depending on distance to the ring. Furthermore, there is one section for exclusive use by holders of same-day tickets, the cheapest ticket type that can only be purchased on the day at the stadium. The stadium often sells out, especially on weekends and national holidays. But even if a day is sold out in advance, a limited number of same-day balcony seat tickets are sold on the day at the stadium. 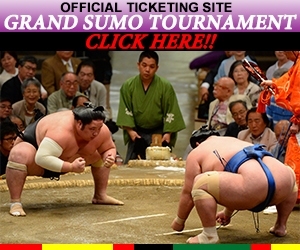 Sumo tickets go on sale roughly one month before the start of each tournament. Lower division matches start from 8:30 (from 10:00 on days 13-15), second division (Juryo) matches from 15:00 and top division (Makuuchi) matches from 16:00. Ring entering ceremonies between divisions are also interesting to watch. The highest ranked wrestlers have their matches just before 18:00. On the last day of each tournament, the schedule is shifted forward by 30 minutes to accommodate the victory ceremony at the end. The stadium atmosphere improves with the arrival of more spectators as it gets later in the day when the most spectacular matches happen. Intervals between bouts also lengthen as they include longer preparation times and more pre-match action between the high-ranked wrestlers. We recommend spectators with limited time to be present at the stadium at least for the top division action between 15:30 and 18:00. For those visiting Japan between sumo tournaments, there are a few other ways to see sumo matches. They include exhibition tournaments that are held across the country in between official tournaments and occasional retirement ceremonies of prominent wrestlers. Retirement ceremonies usually include an exhibition contest, some light-hearted performances by wrestlers and a time-consuming hair cutting ritual to sever the top knot that is symbolic to an active wrestler. See the official website for a calendar. Outside the professional sumo world, there are some universities and high schools that maintain sumo clubs, some of which may be able to accommodate visits by tourists. Furthermore, there are occasional sumo performances or contests at some shrines and festivals. Perhaps the best way to appreciate sumo besides attending a tournament is to visit a sumo stable to witness a morning practice session. Sumo stables are where the wrestlers live and train together and where all aspects of life, from sleeping and eating to training and free time, are strictly regimented by the stable master. There are about forty stables, all of which are located in the Greater Tokyo Region, especially in Tokyo's Ryogoku district. However, sumo stables are neither public places nor sightseeing spots. Only a small number of stables accept visits by tourists, and they insist that tourists are accompanied by a person who is fluent in Japanese and closely familiar with the customs of the sumo world. Furthermore, visitors are expected to follow the house rules strictly and not disturb the training session. Expect to sit silently on the floor for two to three hours. In practice, it is very difficult for foreign tourists to visit a stable on their own. Instead, the recommended way to witness a morning practice is to join a guided tour. Various organizations and companies, such as Voyagin and Japanican, offer such tours and typically charge around 10,000 yen for a single person and around 4000 yen for additional group members. This small museum is located inside the Kokugikan sumo stadium. It houses rotating exhibitions about sumo, including a collection of portraits of past and present yokozuna, pictures of significant events in the history of sumo, and ceremonial aprons worn by retired prominent wrestlers. During Tokyo tournaments, the museum is only accessible to tournament ticket holders. Before the first sumo stadium was built in 1909, sumo tournaments were held outdoors at Ekoin Temple, just a short walk from Ryogoku Station. Today, visitors to the temple can see a stone monument on the temple grounds that honors past wrestlers and stable masters. Chanko nabe is the staple food of sumo wrestlers. It is a hot pot dish that comes in many varieties and contains vegetables, seafood and meat. There is a high concentration of chanko nabe restaurants in the Ryogoku area, many of which are managed by retired wrestlers. Some restaurants even have a dohyo ring in them, which patrons can take pictures with or enter for the experience. Tomioka Hachimangu Shrine was the site where sumo tournaments were held for about a hundred years during the mid Edo Period (1603-1867). At the shrine grounds today are monuments on which the names of past and present yokozuna and ozeki (the second highest rank of sumo) are inscribed. There is also a small treasure house (300 yen) which displays some sumo-related items such as woodblock prints of wrestlers and old ranking publications. The museum is usually locked, and prospective visitors should inquire at the shrine office.